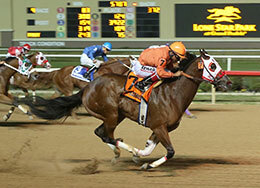 Ivoriona, under jockey Luis Vivanco, winning the $94,700 Speedhorse Lone Star Paint & Appaloosa Futurity(G1) at Lone Star Park. GRAND PRAIRIE, TX�OCTOBER 29, 2016� All eyes were on the paint horse filly Ivoriona tonight, and what a show she put on winning the 11th running of the Grade 1, $94,700 Speedhorse Lone Star Paint & Appaloosa Futurity. Also, the win put her on top in the point standings and was awarded the 2016 Speedhorse Triple Crown High Point Champion trophy and a $5,000 bonus check among other prizes. At the start to the outside of Ivoriona, Jess Cuz and Cherry Cobbler bumped and to her inside, Jess Icy broke out across several lanes, but none of that trouble mattered because the speedy filly was already a length in front of everyone after the gate opened. A daughter of IVORY JAMES, Ivoriona clocked the 400 yards tonight in 19.942 over a fast racetrack earning a speed index of 88. She was the betting favorite at odds of 0.40-1 and finished a length better than Phq Goodbye Earl in second. Tell Him Bye was another � length in third. Mutuels on the winner returned $$2.80, $2.40 and $2.10. Place returned $5.40 and $4.00. Show wagers returned $6.20. Jess Cuz, Crm Radio Flyer, Ho Lotta Love, Dtl Batter Up, Jess Icy, Paint Me Turnpike and Cherry Cobbler completed the order of finish. With the win Ivoriona increased her earnings for owners Mickey Johnson & Randy Hill to $126,804. It was her fifth win from seven career starts. She is trained by Randy Hill and was ridden to victory tonight by Luis Vivanco, his third win on the card.